that's what you are thinking, right? if it is then you'd be like the hubs & the dude. especially when they saw their plates! and yes. this is a crappy cell phone picture. in my 'i'm gonna eat my shoe in a minute' state, this was all i got before i shoveled it in my mouth. i know. i am so lazy. but please don't judge this delicious dish on my crappy photo. see this one is a MUCH better visual representation of how it tastes. so obviously i can't claim rights to the recipe because it's totally not mine. & i was about out of everything except for cheese, rice & ground beef! you know google is a girl's best friend. well, for a girl like me who has no talent for concocting recipes. 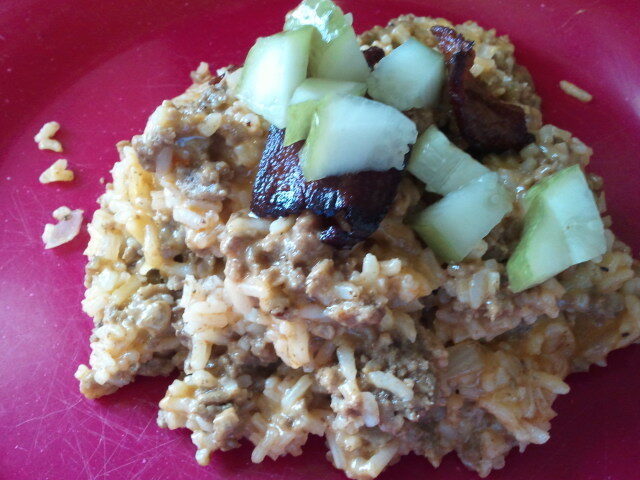 and here is her bacon cheeseburger rice recipe. and you are gonna love the crunchy, salty pieces of pickles. it totally makes this dish! 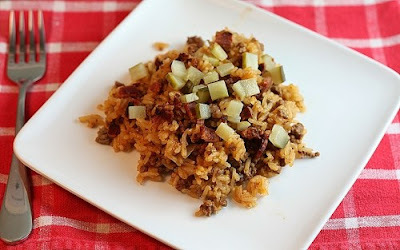 trust me, skip the hamburger helper (gag!) and make this.